Bristol Sonics returned to the top of the West of England League Pool A table on Saturday, following a comfortable 14-58 away win over Gloucestershire Warriors. The Sonics leapfrog Portsmouth Navy Seahawks at the summit of the table with three league games remaining, but are only ahead of their South Coast rivals due to a far superior points difference. With both sides down to a bare 13 due to injury and holiday absences, most predicted a tighter game than the hosts may have feared. However, with Gloucestershire unable to field all 13 players at the start of the match, Bristol were handed an advantage that they ruthlessly made the most of. 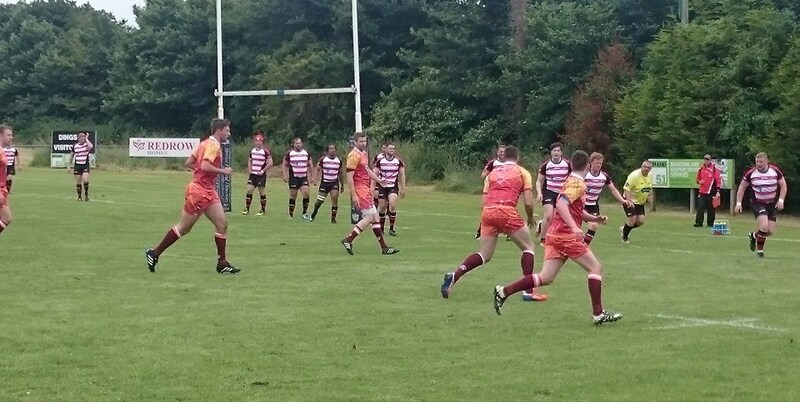 The Sonics were brilliant in the first quarter of an hour, scoring five tries – four of which were converted by player/coach Dom Swann – to open up an almost unassailable 28-0 lead. The first try came within a minute of kick-off, with big Dutchman Mark Wokke – nicknamed “the Viking” by team-mates – collecting a brilliant Byron Edwards offload and sprinting 65 metres to touch down beneath the posts. A minute later, the Sonics were over again, skipper Alex Potts sidestepping his way past a clutch of Warriors defenders before turning on the after-burners. There was little respite for the struggling home side. After eight minutes the impressive Byron Edwards charged through some weak attempted tackles to touch down, Swann adding his third simple conversion, before winger Blake Knowlson finished off a slick, right-to-left passing move by sliding in at the corner. Almost straight from the resulting re-start, opposite winger Ben Lee sidestepped inside his opposite number and ran 70 metres to dive over to the right of the sticks. Swann’s fourth conversion in five attempts made it 28-0 to the visitors with just 16 minutes on the clock. A combination of Bristol errors and penalties for standing offside in defence finally allowed the home side a chance to play with the ball in hand. A more even contest began to develop, with standout player Ash Lewis getting the Warriors on the scoresheet after 28 minutes with a close range solo effort out wide. This setback only seem to inspire the Sonics, though, who grabbed two more tries before the interval. First full-back Jonny Mawer weaved his way over from close range, before centre Alun Roberts-Jones finished off a fine break. Swann converted both tries, to leave the Sonics 40-4 up at the interval. Gloucestershire had the slope at their backs in the second half, and quickly re-doubled their attempts to get something from the game. After only two minutes of the half, Jake Thompson forced his way over from close range, Ash Lewis converting. Six minutes later Bristol stretched their lead again, prop Kieran Harvey powering over for a try that was converted by Dom Swann. Scrum half James Potts, brother of captain Alex Potts, grabbed a brace of tries for the Sonics – one of which was converted by Swann – before Conrad Jones slid over in the right corner for the Warriors, following a one-handed offload from Lewis. With time running out, centre Tom Curtis finished off the game for Bristol, sliding over out wide following another speedy passing move. Bristol’s next game is likely to be a much closer contest. They face fellow play-off hopefuls Oxford Cavaliers at Dings on Saturday, with a win all but securing the Sonics position in the top two. Lose, and they face a fight to the last day of the regular season.